Want to suggest a topic for the next tip? Click here. Use hot water and Ammoniated Wax Stripper, mop and let stand for about 5 to 7 minutes, using a floor machine with a black stripping pad to scrub, do not let dry. Use a wet/dry vacuum with a squeegee attachment to pick-up the old finish and stripper. If you do not have a vacuum, then you must mop up solution until clean. Using hot water with neutralizer in the rinse water, mop floor and allow to dry. Apply floor finish using a lambswool applicator or a new, fine string mop. Apply only a thin coat of floor finish for the first coat and let dry for about 30 minutes before applying the second coat. Apply the second coat the same as the first coat. If you need to bring out the high gloss then apply a third coat. Remember to always let the floor finish dry between coats. Now you have a finished floor that should last under heavy traffic. When mopping the floor always use a neutral floor cleaner that will not soften the finish. Rinse after with clean water. 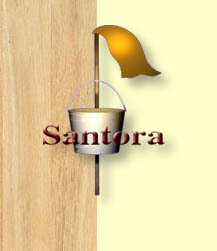 To maintain the shine, damp mop with 4oz of Santora Neutral Cleaner per gallon of warm water. Do not use a cleaner with alkaline base (such as Simple Green, Degreaser, 409, etc.) as it will soften the finish. FF-10A Ammoniated Stripper or #2. FF-01A Santora Metallic Super Gloss 22% solids. 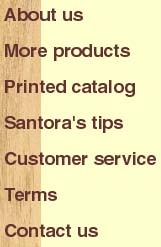 For floor maintenance always use Santora CL-03A All-Purpose Neutral Cleaner. Daily maintenance after floor is finished.